A mischievous teen (Jean-Pierre Leaud) in 1950s Paris repeatedly gets in trouble with his strict teacher (Guy Decomble) and his clueless parents (Claire Maurier and Albert Remy), and tries to run away; eventually, he’s sent to an institution for juvenile delinquents. As Peary notes, Francois Truffaut’s extraordinary semi-autobiographical debut film features “beautiful camera work”, countless “classic moments”, and marvelous performances (especially by young Jean-Pierre Leaud as Truffaut’s alter-ego, Antoine Doinel). A favorite of many film fanatics (including me), it’s difficult to describe just how powerful The 400 Blows really is. Scene after scene (see Redeeming Qualities and Moments below) is a bittersweet delight — as Peary writes, the film is a “tender look at children with [a] universal message [and] much wit”, yet Doinel’s plight “is extremely sad”. Doinel tries his best to survive in the world of adults, yet seems destined to fail or be “caught” no matter how noble his intentions (who can’t relate to this sense of powerlessness from their own childhood?). Truffaut brought Doinel/Leaud back for four sequels: the short film “Antoine and Colette” (part of Love at Twenty, 1962); the delightfully quirky Stolen Kisses (1968); the melancholy Bed and Board (1970); and the disappointing Love on the Run (1979). The first, however, remains the best of them all. Definitely. This masterpiece of the French New Wave merits multiple viewings, and may well become a personal favorite. A must. A classic. Among Truffaut’s most satisfying work and, I agree, the best of the Antoine films. As well, there is a wealth of wonderful moments: among my favorites (a few of them already mentioned) – Antoine copying a friend’s mother’s ‘sick note’ and forgetting to change his friend’s name; Antoine plagiarizing Balzac, then defending his ‘work’ in a bold-faced manner; the accidental fire; the angelic, enraptured faces of an audience of children at a puppet show. Perhaps my favorite scene is near the end, in which the camera stays directly on Antoine as he explains how he got started in life. I think ‘The 400 Blows’ is more successful as a mood piece than as narrative. There’s a stream-of-consciousness quality here – appropriately so; that could very well be the intent. But perhaps that’s why – while I’m in overall agreement with the assessment given and I admire the film – it’s not a particular favorite. I could have less inclination to return to films that are episodic. 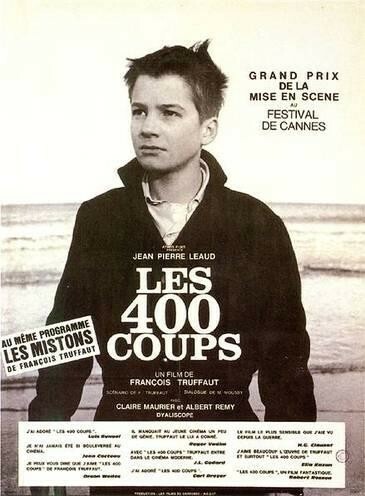 I recall when I first saw ‘The 400 Blows’, and it had a particular power for me. Somehow I don’t feel that same, or similar, power when I go back to it. But that’s not the fault of the film.